We were blown away by the hundreds of amazing entries in this year's Inhabitots Green Halloween Costume Contest. We had so many entries in fact, that it was almost impossible to pick our finalists. Among the creative costumes -- 9 (count 'em!) owl costumes that went head to head in the first ever Inhabitots Battle of the Birds, 2 wheelchair-ready costumes, 2 cardboard box carnival claw get-ups, a few LEGO-inspired duds, and so many more! But even though we had the tough task of narrowing down the field to 36 fantastical finalists, in the end, the decision came down to your votes. 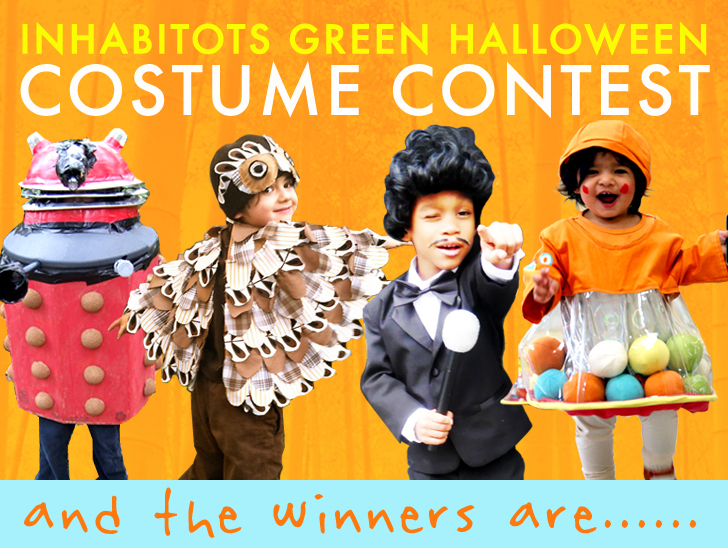 The results are in, and now we present to you this year's Inhaibtots Green Halloween Costume Contest winners! Crystal Evans-Pradhan was inspired by her daughter Sophie’s favorite toy, B. Toys Poppitoppy, and she turned it into a clever Halloween costume. She clearly did a great job making it look like the real thing — her creative endeavor earned a whopping 434 votes to take the grand-prize win! 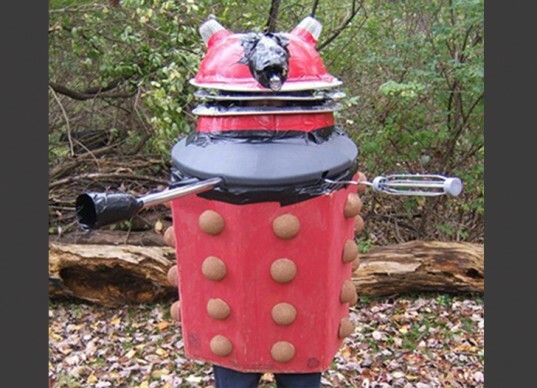 Zephan and his Dad created this Dalek Halloween costume out of random junk they found in the garage including cardboard boxes and a garbage can top. They took second place with 325 votes! 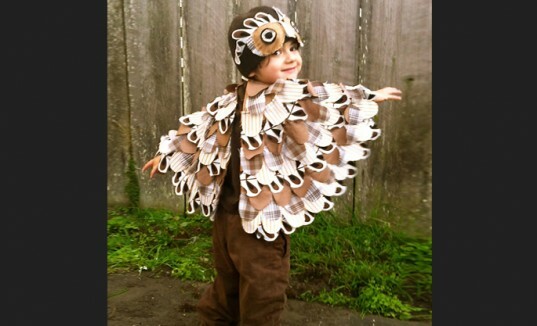 Upcycling 3 men’s dress shirts, Michele de Jesus sewed this impressive “Buhito con Alitas” little owl costume for the third place win. Her bird won out against the other eight owls in our contest to earn 146 votes. We couldn’t get over this trio of laundry-clad kids that makes the chore of getting clothes clean look oh-so-fun! Stephanie Pearson says her kids asked to be a laundry room for Halloween this year, so the family went to work transforming cardboard boxes, empty detergent bottles, and more into this absolutely adorable dirty laundry, washing machine and dryer Halloween costume. This little 4-year-old Sammy Davis Jr. made our hearts sing! Nicole Mitsch put together the easy-peasy costume using a thrift store wig and an old tuxedo her son had worn to a wedding in the past. The classic kids tune “The Wheels On the Bus” comes to life with this stroller getup. Because she loves the song so much, Little Ava’s parents built a school bus costume from a cardboard box and painted it with non-toxic paint, and we love the results! GRAND PRIZE WINNER: Mom-Made Poppitoppy Crystal Evans-Pradhan was inspired by her daughter Sophie's favorite toy, B. 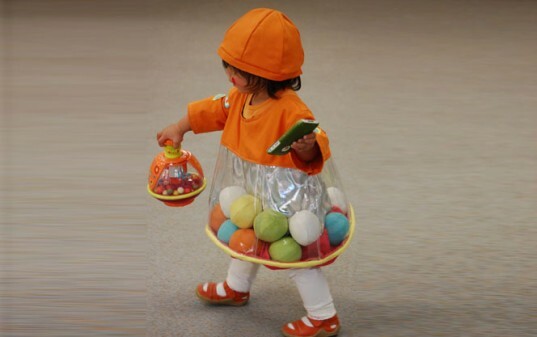 Toys Poppitoppy, and she turned it into a clever Halloween costume. She clearly did a great job making it look like the real thing -- her creative endeavor earned a whopping 434 votes to take the grand-prize win! SECOND PLACE WINNER: Supreme Dalek Halloween Costume Zephan and his Dad created this Dalek Halloween costume out of random junk they found in the garage including cardboard boxes and a garbage can top. They took second place with 325 votes! THIRD PLACE WINNER: Buhito con Alitas Upcycling 3 men's dress shirts, Michele de Jesus sewed this impressive "Buhito con Alitas" little owl costume for the third place win. Her bird won out against the other eight owls in our contest to earn 146 votes. 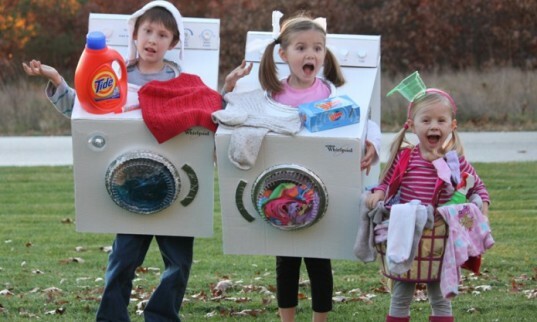 1st PLACE: Dirty Laundry, Dryer and Washing Machine Halloween Costumes We couldn't get over this trio of laundry-clad kids that makes the chore of getting clothes clean look oh-so-fun! Stephanie Pearson says her kids asked to be a laundry room for Halloween this year, so the family went to work transforming cardboard boxes, empty detergent bottles, and more into this absolutely adorable dirty laundry, washing machine and dryer Halloween costume. 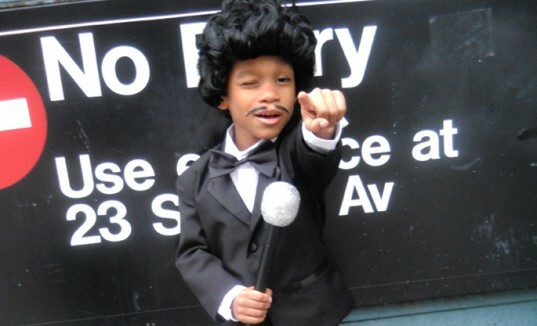 2nd PLACE: Sammy Davis Jr. Costume This little 4-year-old Sammy Davis Jr. made our hearts sing! Nicole Mitsch put together the easy-peasy costume using a thrift store wig and an old tuxedo her son had worn to a wedding in the past. 3rd PLACE: The Wheels On The Bus Go Round & Round The classic kids tune “The Wheels On the Bus” comes to life with this stroller getup. 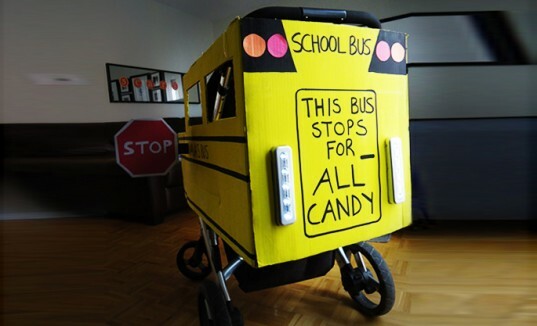 Because she loves the song so much, Little Ava’s parents built a school bus costume from a cardboard box and painted it with non-toxic paint, and we love the results! Sock Monkey Costume made from old socks. Maya's Mermaid made from last year's Statue of Liberty costume!